Literally translated, it means Mint-Rice. This recipe was shared by my cousin who whips up amazing weekend specials.The Pudina Rice is an easy to make dish for Sunday visitors, and guaranteed to sweep them off their feet. 1. In a wok, when the oil is hot, fry the jeera, bay leaf, cardamom sticks, and elaichi. 2. Add the tomatoes and let it cook for a bit,but not completely. 3. 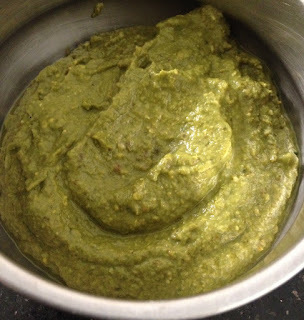 In the meanwhile, in a mixie, add pudina, onions, green chillies, ginger-garlic and make a fine paste. 4. Add this paste to the tomatoes. 5. Add the necessary spices. 6. Mix well with basmati rice. 7. Garnish with ghee, cashews, and coriander leaves. You can serve cucumber-tomato raita as a side dish.